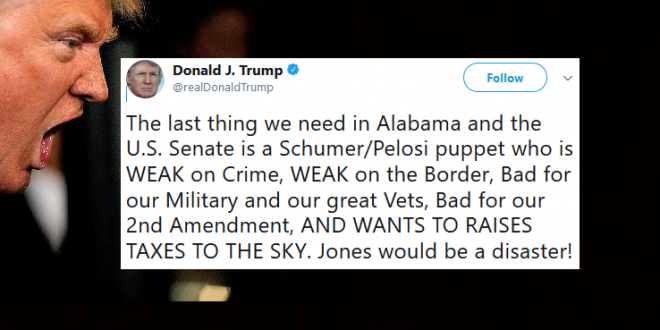 Trump Doubles Down: Doug Jones Would Be A Disaster - Joe.My.God. President Donald Trump on Sunday doubled down on his support for embattled Alabama Republican Senate candidate Roy Moore, taking to Twitter to disparage Moore’s opponent, Democrat Doug Jones. Against the wishes of Senate Majority Leader Mitch McConnell (R-KY) and other top Republicans, the president decided last week to take Moore’s side amid mounting allegations of sexual misconduct. The Republican National Committee and the National Republican Senatorial Committee have cut their financial ties with the Moore campaign, but the Alabama GOP is standing by Moore. The choice is crystal clear for Alabama. Do you want a Senator who rapes 14 year old girls or do you want a Senator who actually has a sense of humanity. It’s that simple. Trump wants a Roy Moore in the Senate like Roy Moore wants in a mall.